Performers include: Erik Estrada, Robert Pine, Larry Wilcox, Paul Linke, Brodie Greer, Randi Oakes, Lew Saunders, Lou Wagner, Michael Dorn, Tom Reilly, Tina Gayle, Brianne Leary, Clarence Gilyard, Jr., and Bruce Penhall. Two motorcycle cops travel the freeways of Los Angeles as part of the California Highway Patrol (CHiPs). 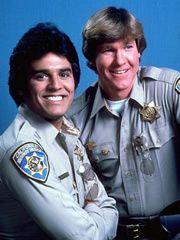 Both bachelors, Jon Baker (Larry Wilcox) is strait-laced while Frank “Ponch” Poncherello (Erik Estrada) is a more macho and romantic free spirit, much to the frustration of gruff Sergeant Joseph Getraer (Robert Pine). The partners’ adventures typically involve human-interest stories rather than serious crimes. In later episodes, Officer Steve McLeish (Bruce Jenner) sometimes fills in for Ponch. In the final season, Jon is replaced by Officer Bobby “Hot Dog” Nelson (Tom Reilly) who has a younger cadet brother named Bruce (Bruce Penhall). Other regular officers include Gene Fritz (Lew Saunders), Barry Baricza (Brodie Greer), Artie Grossman (Paul Linke), Sindy Cahill (Brianne Leary), Bonnie Clark (Randi Oakes), Jebediah Turner (Michael Dorn), Kathy Linahan (Tina Gayle), and Benjamin Webster (Clarence Gilyard, Jr.). Harlan Arliss (Lou Wagner) keeps the force’s vehicles on the road as the resident lead mechanic.